Bridging the gap between mathematics and engineering, Numerical Analysis with Applications in Mechanics and Engineering arms readers with powerful tools for solving real-world problems in mechanics, physics, and civil and mechanical engineering. Unlike most books on numerical analysis, this outstanding work links theory and application, explains the mathematics in simple engineering terms, and clearly demonstrates how to use numerical methods to obtain solutions and interpret results. 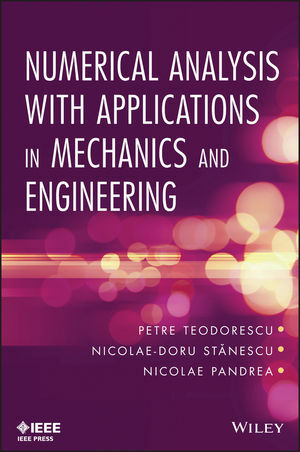 Numerical Analysis with Applications in Mechanics and Engineering is a one-of-a-kind guide for engineers using mathematical models and methods, as well as for physicists and mathematicians interested in engineering problems. PETRE TEODORESCU, PhD, is a Professor in the Faculty of Mathematics and Computer Science at the University of Bucharest in Romania and the author of 250 papers and twenty-eight books. NICOLAE-DORU STÂNESCU, PhD, is a Professor in the Faculty of Mechanics and Technology at the University of Pite&scedil;ti in Romania and the author of 200 papers and ten books. NICOLAE PANDREA, PhD, is a Professor in the Faculty of Mechanics and Technology at the University of Pite&scedil;ti in Romania and the author of 250 papers and six books.